With the advent of the era of total gasificationtraditional oven began to be perceived by us as a relic of the past. Special innovations finishing almost developed, but in vain! 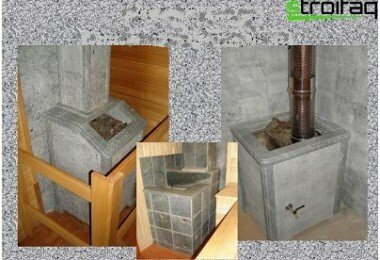 Stove - a reliable heat source, do not suffer from power outages and energy prices (gas, diesel fuel, pellets). Today there was a reappraisal, re-claimed service stove-makers, recovering almost forgotten secrets of the oven trim. If you decide to put in order the old furnace or to plaster a new, inevitable question proper selection of mortar, because the requirements for the finishing materials are high - the plaster will be repeatedly heated afterwards. It is important that the substrate be environmentally friendly - when heated can be allocated a variety of toxic compounds, which is unacceptable, in addition, the plaster must possess good thermal conductivity and elasticity. Consider the various options for the composition of the plaster to the question "what to plaster furnace" has found the only correct answer. 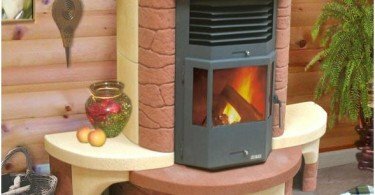 Firstly, plaster furnace gives a neatthe appearance, the interior is decorated with pomescheniya.Vo Secondly, plastering enhances the strength and tightness of the furnace laying. Indeed, over time due to temperature differences in the masonry cracks, through which the room can penetrate smoke, which has a negative impact not only on the interior (sooty walls, curtains and furniture), and most importantly - it is dangerous to health. The cost of many heat-resistant materialspresented on the shelves of the supermarket building significantly higher blends traditionally used for plaster furnaces on the basis of clay. 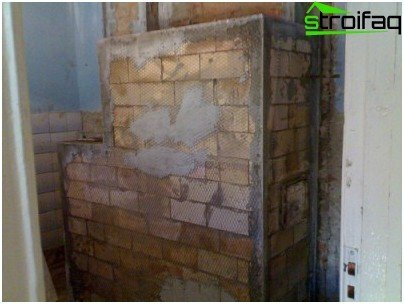 Can plastered oven glinopeschanym solution with the addition of cement or lime or lime-plaster solution. Most frequently used solutions based on clay. 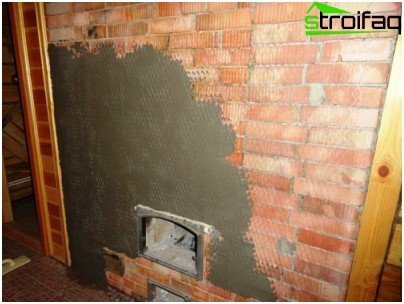 Plaster brickwork can only after full cure, to prevent shrinkage (about a month). The percentage of ingredients in solution glinopeschanom differently. Everything depends on the fat content of clay. If the index higher fat content - 1 part clay will need 4 parts sand. In order to increase the strength of the plaster in the solution are frequently added additional components: fiberglass or asbestos. First of all, it is necessary to properly prepareSurface: free of dirt, dust, old grout. In order to improve adhesion of the solution with brickwork cleaning recommend additional sutures to a depth of 5 to 10 mm. The seams recommended hammer nails (40-50 mm long) with a pitch not more than 15 cm, so that they protrude outwardly approximately one quarter length. It is desirable to treat the surface of a specially designed for priming purposes. To create additional roughness (for the strength of the connection) should use a fiberglass mesh. 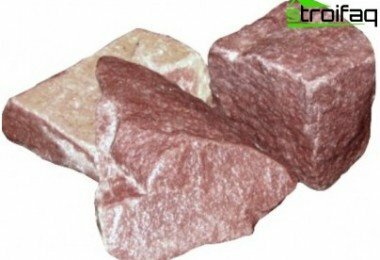 It is fastened to the masonry by means of a liquid layer rastvora.Oshtukaturivayutsya a hot wall. The solution is applied in stages (layers). be sure to moisten the laying of water before applying the plaster. The first layer of plaster is necessary to make a liquid, creamy consistency. After curing the first layer may be applied to a second thickness up to 1 cm after the second grabs layer can begin to equalize the solution was poverhnosti.Posle bit seize, can wipe the surface. Before grouting is necessary to moisten the plaster with water and then wipe in a circular motion all the bumps using a grater. If after drying visible crack should extend them, moisten with water, fill with a solution and, after drying, wipe. To plaster furnace are specialrequirements. 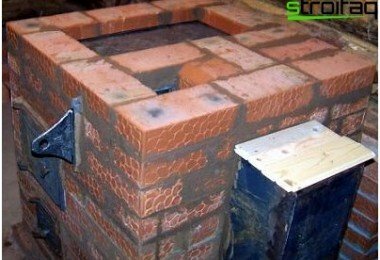 Compositions for plastering mortar oven are quite different from conventional cement-sand mortar for plastering the walls of houses. This is due to the fact that the furnace masonry when heated has the ability to expand and secure connection is extremely important that the plaster was supple. In addition to good oven and quickly warmed up the room, furnace plaster must have good thermal conductivity. 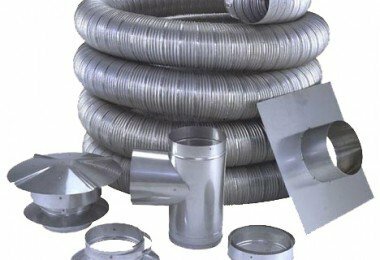 In order to impart such properties of the solutions are added various components: clay, fire clay, asbestos, glass, salt. They are used as a simple clay, as well as complex solutions that can be prepared with their own hands or buy ready-mix in the store. Examples of common formulations of mixtures consider in Table 1. Consider the recipes commonly used formulationsPlaster: part clay, part of the limy test, one-tenth of the asbestos and two parts of sand laid at the same time. The mixture should be mixed thoroughly and gradually add water, bring to desired consistency. Another recipe solid plaster (the onlylack of a mixture - the need for rapid intervention, because an hour after cooking the mixture to be unsuitable): two parts of sand need to take on one of the clay and cement (type 400 or 500). First, water, sand and clay needed to knead a stiff dough, and then enter into the composition of cement and asbestos, add water and mix thoroughly. The density of the solution should be smetanopodobnoy consistency. Any structure must include astringentaggregate and water. Binder may be represented by a single component or a mixture (e.g., cement and lime). If you decide to use a mixture of high-strength gypsum-based note an important feature: the blend hardens very quickly (over 6 minutes). Half an hour later, such a mixture is already unsuitable for use. By selecting one of the above composition recipesa mixture of plaster, or using a mixture of purchase, make sure the quality of a solution. 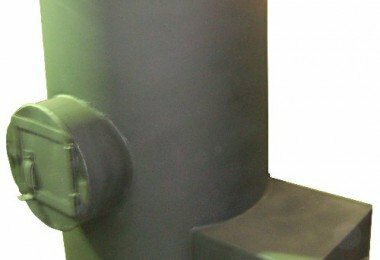 Correctly prepared solution should be easily and evenly applied to the clutch, problems with smoothing and should not be. It is important to respect for proportions - adjust the viscosity by adding water, do not exceed the rate of sand - will suffer the plasticity of the solution.